I had put my name down on the Contiki Activities List to go on a 45 minute Helicopter Tour that morning with everyone else. We were all told to meet on the bus at 7am sharp. At 7.10am I got a call on the phone in our room from our Tour Manger Blake asking where I was as everyone was waiting on the bus. I quickly realized I had slept through my alarm!!! I couldn’t believe it. I jumped out of bed so fast with my heart racing with anxiety. He said I had 3 minutes to get to the bus otherwise they were leaving without me. So I quickly grabbed some clothes and put them on, grabbed my make up bag and my contact lenses and shoes and ran to the bus. Everyone saw me run to the bus dropping everything along the way! 😂😂 what a loser. I had a small digital camera in my bag however so I just used that for the Helicopter tour. Unfortunately I have no pictures to upload on here though from it. When we got to the helicopter place, we watched a safety video and all got weighed so they could put us in the appropriate helicopters for our weight. This stomach pain has been an on-going problem with me for anyone who knows me. I used to always get really bad stomach cramps every few months for no reason. One time I ended up in A&E in Australia because I was in so much pain. I didn’t end up seeing a doctor then to find out what was wrong with me because the emergency room was too busy that night but they told me they thought it was something to do with my gallbladder which is really annoying. Apart from my stomach hurting the whole time and wanting to bend over into a ball, the helicopter tour was great. Riding in a helicopter is so much fun!! I got to sit at the front next to the pilot and we had amazing views of the whole canyon. My pictures aren’t that great though because my camera kept getting the glare of the helicopter windows in the photos. 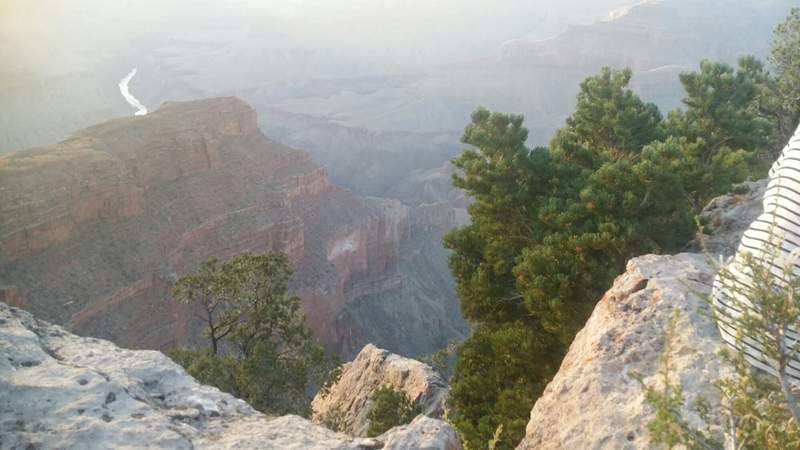 The Grand Canyon is kind of one of those things to see in real life to appreciate it anyways. When we got back to our lodge, I went back to bed and curled up in a ball for about 4 hours and went to sleep. 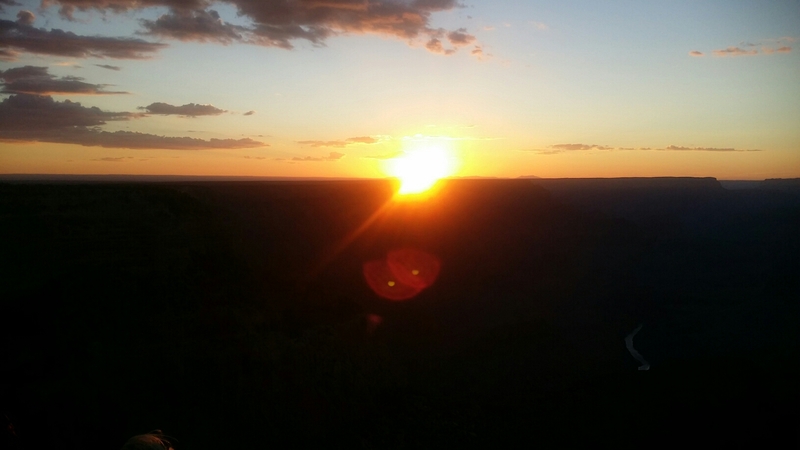 When we got back to the lodge, we met up with everyone else to take the bus to the edge of the Canyon to watch the sun set. A few people on Contiki had been drinking all afternoon so half of us were pretty loose and ready to party. I however stuck with my 2 cans of ciders as not to upset my tummy too much! As it was my Birthday, everyone sung me Happy Birthday at the Canyon which was nice and I was presented with a slice of carrot cake and some candles that we couldn’t light because it was far too windy. Blake tried to light a match for me like 3 times so I could blow it out and make a wish but it was far too difficult haha. I tried to take pictures of the Canyon at sunset but it was hard to see the Canyon with the light from the sun shining into the camera. Note to self: Must take a Photography Course of some type. Once the sun had set and we’d all had a group photo and a cup of wine, we lined up for the local bus to take us back to our lodge. When we got back, we all went to the restaurant (well it’s more of a big hall where you go and get food from different cafeteria areas and pay for it at the counter) and just sat and talked for a bit. The hall is where you have the wi-fi but it’s terrible when everyone is on it. I got to bed just before midnight I think so it was a bit of a late one for me. Once you find a group you like, it’s hard to get away because you’re all getting to know each other more and more so everyone just talks about their life and starts relating to each other. So far Contiki has been really fun. Everyone seems to have a good attitude and we all kind of look out for each other or make an effort to chat to one another. Of course with any type of big group there’s the odd one or two that’s a bit ‘different’ to the rest in terms of not making an effort to get along or causing problems but I think we’ll all having a good time. Can’t believe it’s only been nearly a week! 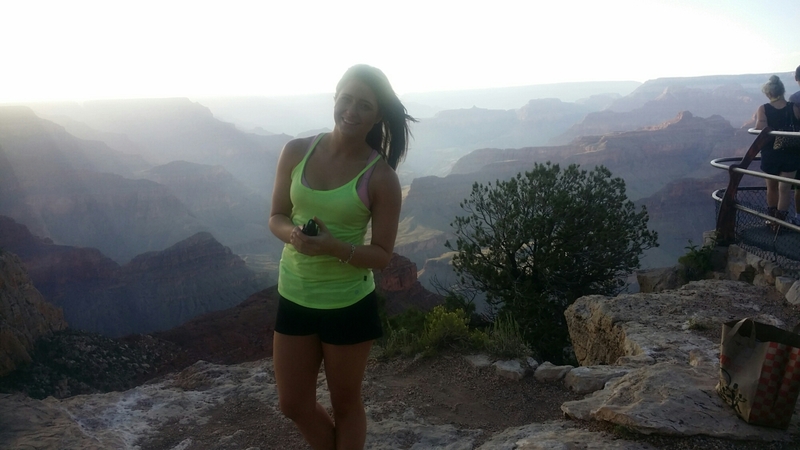 Cool post, I did the drive from Vegas to the Grand Canyon, it was really great!